Yellow Cab of Prince William County is a family owned and operated business providing the citizens and visitors of Prince William County local and long distance transportation needs since 1978. In 1978, Ira (Corky) Cochran purchased Radio Cab Company (founded in the 1940s) and shortly after that purchased Quantico Yellow (founded in the 1940s). The combination of these two taxi cab companies became Yellow Cab of Prince William County. Corky and his daughter worked diligently through the years to build a company that offered safe and reliable transportation. The company is now owned and operated by Corky’s daughter, Tammy Beard, and registered as a Woman Owned Small Business in Virginia. Several members of the third generation are involved in the daily operations and at times some of the 4th generation may be found around the office. In addition to our 36th year milestone, this year we are also celebrating our one year anniversary of offering wheel chair accessible taxi service. Yellow Cab is the first and currently the only licensed Taxicab Company in Prince William County to offer this service. The addition of accessible vehicles to transport people with disabilities to our fleet allows individuals to be transported in their wheelchair at metered taxi rates. All accessible vehicles are equipped with ramps and safety restraint systems. Vehicles are ADA compliant and will accommodate standard sized wheelchairs and power chairs with up to four comfortable seats for other passengers. Drivers of these vehicles have received training in the proper securing of mobility devices and have passed an extensive training course through the Independence Empowerment Center and other resources. We were recently honored to receive an Outstanding Community Service Award from the City of Manassas, the Independence Empowerments Center’s Senator Charles J Colgan Advocacy Award, the Prince William Chamber of Commerce Innovative Practice/Partnership of the Year and first place in the motorized division of the Dumfries Christmas Parade. Yellow Cab is proud to be a part of the business community in Prince William County. We take pride in offering safe, affordable transportation options to all citizens and visitors of Prince William County and look forward to many more years of service. "Yellow Cabs are like sidewalks. Every town has them, but none of them are connected." All drivers are independent contractors licensed by Prince William County. All drivers and vehicles operate under the rules, laws, and regulations of the Commonwealth of Virginia and the Prince William County Government. All vehicles are inspected no less than three times annually for your safety. To have wheelchair accessible taxi cabs; in fact the ONLY cab company! 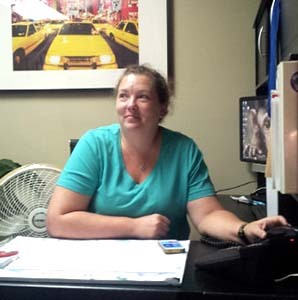 Yellow Cab is a local industry leader and we have a long and documented history of giving extraordinary customer service. As the premier transportation firm in Prince William County, we take our responsibilities very seriously as an employer and an active member of this community. Yellow Cab participates in many community events, including the Washington Regional Alcohol Program’s Sober Ride program. This program offers free rides home to impaired drivers on select Holidays throughout the year. We are a multi- year Sponsor of the ADA fair that marks the anniversary of the signing of the American’s with Disabilities Act and is hosted every summer by the Independence Empowerment Center in Manassas. We also sponsor youth sports teams throughout the county and belong to the Prince William Chamber of Commerce and the Haymarket Gainesville Business Association. Several years ago Yellow Cab initiated an unsubsidized discount program for Senior Citizen transportation. That program is still active and growing daily. We additionally participate in several transportation programs for Senior Citizens. Several years ago, we initiated an unsubsidized senior transportation program called Senior Ride which offers discounted fares to people 65 and over. Yellow Cab is a proud sponsor of Little League Baseball and other youth sports. Our participation and sponsorships are our way of giving back to the community that we live and work in every day.